It looks like Samsung might not be the only company looking to implement different notch styles in its 2019 (and beyond) smartphone designs, as Motorola’s Moto G7 lineup alone is expected to employ three types of screen cutouts. After already seeing the “standard” G7 model and the Plus version prematurely rendered with the popular “waterdrop” aesthetic, today we get to check out the significantly wider notches on the Moto G7 Play and Moto G7 Power in a fresh batch of leaked press-friendly images. 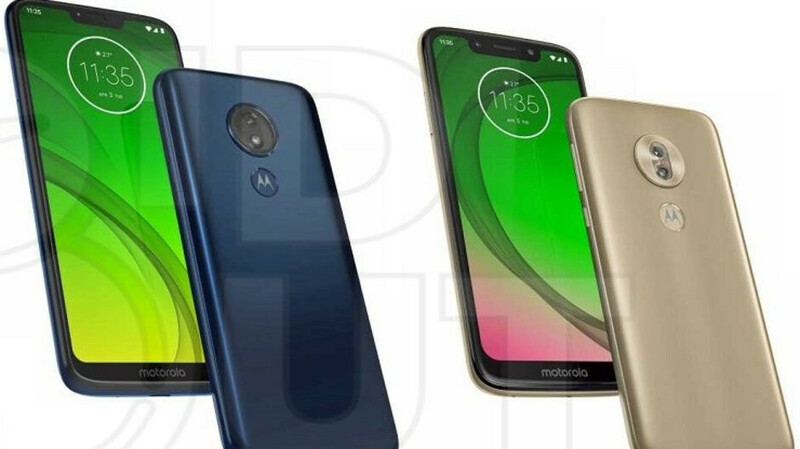 There’s obviously no guarantee these early product depictions, exclusively published by DroidShout, are legit, although the Moto G7 and G7 Plus definitely feel familiar, while the G7 Play and G7 Power are largely similar, which fits the company’s M.O. The four handsets obviously share their general design language, as well as a relatively thick “chin” accommodating the “motorola” logo. The entry-level Moto G7 Play appears to sport the widest notch of the bunch, which is wide enough to house a front-facing camera and LED flash module, but surely not fancy enough to enable 3D facial recognition technology. The Moto G7 Power, which is naturally expected to stand out with its industry-leading battery life, should feature a slightly smaller notch with a selfie shooter but no flash. That doesn’t sound ideal for selfie addicts, although if it helps keep the price point low, the payoff might be worth the sacrifice. Meanwhile, all four G7 variants are tipped to rock rear-mounted fingerprint scanners (embedded in their “batwing” Motorola logos), with the G7 and G7 Plus sharing dual cameras on their back, downgraded to single imaging sensors for the G7 Power and G7 Play. Moto lost its way years ago. Not just talking about the notches, but they are completely devoid of any innovation now. It's sad because they were among the best in the Android space for many years.